For an introduction to how& Themer layouts work with The Events Calendar plugin, see the overview article. Here's how to create and design a Themer layout for an Events archive page. Tip: It helps to have some events created first so you have something to preview as you design the layout in Beaver Themer. Verify that Type is Themer layout and for Layout select Archive, then click Add Themer layout. Displays a list of events in all categories. Lists all the events assigned to the categories you choose. Lists all the events assigned to the tags you choose. In the Preview as field at the top of the page, select Event Archive if you want to apply this layout to the Events page. Select a category or tag archive if you are designing one of those types of archive pages. The Themer layout opens with the Archive template for standard posts. To use the Events template to start building your page, click Templates in the upper right corner and make sure General is selected. Select the Events template, then click Replace existing layout. This template contains only the Event Calendar module. Note: The calendar will only display if you have Preview as: Event archive selected. 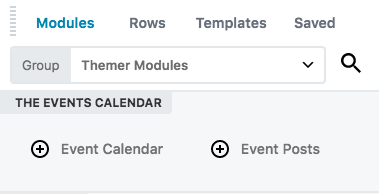 When you edit an Archive-type Themer layout and have The Events Calendar plugin installed, there's a special content group in the Content panel called Themer modules, and under that is a section called The Events Calendar containing two modules: Event calendar and Event posts. See the Related Articles for a detailed description of each module.